Day 3 saw 22 players return for their chance at poker fame, sadly only one of these players would finish the day with their dream still intact. Richard Teatum was the first person to fall, and after him the flood gates opened with players dropping and 18-handed play being reached fairly early on. Players barely had time to get used to their new seats after the two table redraw that takes place once 18 players are reached with Randolph Lanosga, Paul Vas Nunes, and Sam Holden all making their respective exits within two hours of play. Players still seemed to keep falling to the way side with Christopher Odonnell, Bastian Fischer, Dmitrii Valouev, Michael Graydon, and Alexander Queen all finishing their day before the final table. With the elimination of Queen, the remaining player’s chips were bagged up and the competitors voyaged over to the Pavilion room main stage to finish things out. Keeping up with the pace of the day Gianluca Mattia took his leave during the first couple of hands of 10-handed play. Things slowed down once the official final table was reached. Thomas Junek was the big man on campus possessing more chips than anyone at that point in time, and David Borg was at the bottom of the totem pole. Play seemed quite tame with plenty of small pots, but that could only last for so long. Eventually a three-way pot brewed up that saw Eliyahu Levy come out the other side with a monster stack. In order to get that stack Levy had to knock out Bassel Moussa in 9th place. Tomas Trampota was next to leave as he was basically crippled in the Moussa knock out hand. It was around this time that Borg started to move up the counts, taking a big hand off Junek, solidifying his place at the final table. A Steven Goldber elimination in 7th and a Andrew Taylor knock-out in 6th kept the gears of this final table progressing. After the elimination of Taylor the cards refused to let anyone leave, a short stacked Junek managed to get all in against Donald Vogel with the worst of it, but came out the other side with the winner. A short stacked Eastgate then did the same thing to Eliyahu Levy giving Eastgate an essential double up . Next it was Donald Vogel’s turn to move his short stack all in and come back from being behind to double up. This string of double ups couldn't last forever, as Levy was sent home in fifth after losing a huge pot to Junek. After the hand Junek possessed a stranglehold on the chip lead possessing half the chips in play. 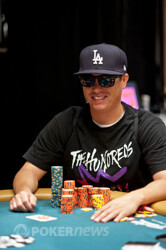 Peter Eastgate was next to fall after his couldn't outrun Borg's , and the 2008 Main Event Champ was sent home in fourth. Eastgate had a strong showing today making good calls and finding good spots to acquire chips, but a tough beat late crippled the champ. Donald Vogel then made his exit after his short stack never seemed to pick up any traction late in the game. 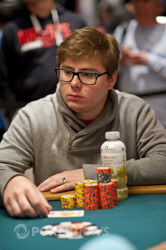 Vogel settled for a nice $289,530 payday for his third place. Heads up play got started right off the bat with Junek and Borg battling it out in one of the bigger pots of the night that saw Junek walk away the victor. Borg won the next battle though with a flush for a nice double up. In the end though Junek came out on top after Borg three-bet shoved with . Junek made the call with and came out on top. 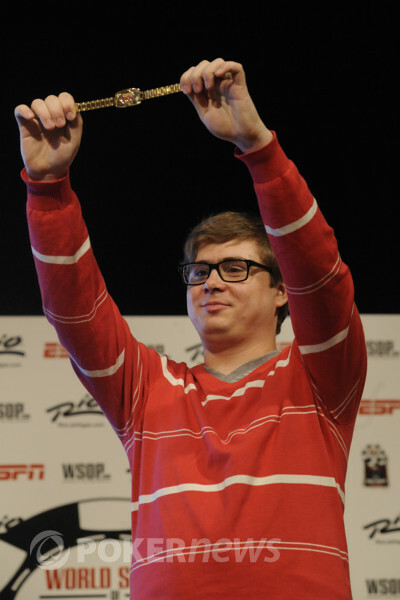 This not only was Junek's first bracelet, but this is also his first World Series of Poker cash. Congratulations to Tomas Junek on winning Event 56: $1,500 No-Limit Hold'em. David Borg started the action by raising to 250,000. Tomas Junek thought for about 30 seconds before assembling a three bet of 700,000, and sliding it into the middle. Borg took little time in moving all in, and Junek quickly called. Both rails were yelling out for cards as the dealer fanned out a flop of . Borg caught a piece of the flop, but he would need to get more, as Junek's tens were still in the lead. The turn brought the , bringing a straight draw for a chop on board. Borg would need a king, five, or three to survive the hand. Junek's rail stormed the table, nearly knocking it over in the process, while a dejected Borg headed to his rail to be consoled. For his valiant effort, Borg will take home $410,517. Tomas Junek raised from the button and made it 225,000. David Borg in the big blind made the call and the dealer spread a flop. Both players checked and it was off to the turn. The on fourth street saw a check-call from Borg for 275,000. The on the river brought another check from Borg, and a bet of 300,000 from Junek. Borg made the call and Junek flipped over for a pair of tens. Borg mucked, and Junek took the pot. On a flop of , Tomas Junek check called a bet of 125,000 from David Borg. The hit the turn, and both players checked. On the river, the , Junek led out for 250,000. Borg counted out the chips for a call, then began to count out his remaining stack. After about 45 seconds of thought, he went all in! Junek asked for a count, and when he found out the total, 1.675 million, he made the call! Borg flashed a big smile, showed his rail his cards, then tabled for a flush. Junek look disappointed as he showed for two pair. After that hand, Borg is back up to 3.4 million, though Junek is still in control with over nine million. The first hand of heads up play consisted of Tomas Junek raising it up to 225,000 from the button and David Borg raising to 575,000 from the big blind. 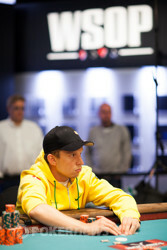 Junek made the call and both players were granted access to the flop. The dealer spread a flop which prompted a bet of 700,000 from Borg. Junek made the call and we were off to the turn. It was here on the fourth street that Borg bet out 1,000,000. Junek's response was to announce "all in". Borg then quickly folded, but showed . After a short 10 minute break, the cards are in the air again. 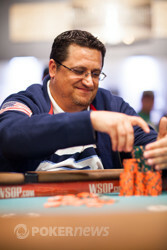 Donald Vogel moved all in from the button for about 1,400,000. Tomas Junek made the call from the big blind and cards were tabled. It just wasn't meant to be for the 2008 Main Event Champion. Shortly after being crippled, Eastgate shoved all in for his last million. It folded around to David Borg, who called as soon as he looked at his cards. The board provided no help for Eastgate, as it ran down . Eastgate will take home just under $210,000 for his efforts, while David Borg jumps up to four million after the hand.